Some of my clients have poured hours into online research and found pictures of projects that inspire ideas I can integrate into their design. Websites like Houzz, Pinterest and social networking sites have made it possible for craftsmen and design professionals to share ideas like never before and the result has been massive traffic to these sites by people looking to make their home renovation dreams a reality. My client had been on pinterest and found this picture that started the ball rolling. The client wanted something more refined and permanent. The back yard offered limited space so it was important that the patio could entertain with or without the fire pit in use. That is one consideration when installing a permanent fire pit and we wanted a way to keep the space flexible day and night. incorporates a hexagonal swing that surrounds half of the paver patio with a raised stone fire pit in the center. There is also a pergola top over the swings to provide some shade as there are no mature trees on the property. Look closely at the table, it has a hole for an umbrella! 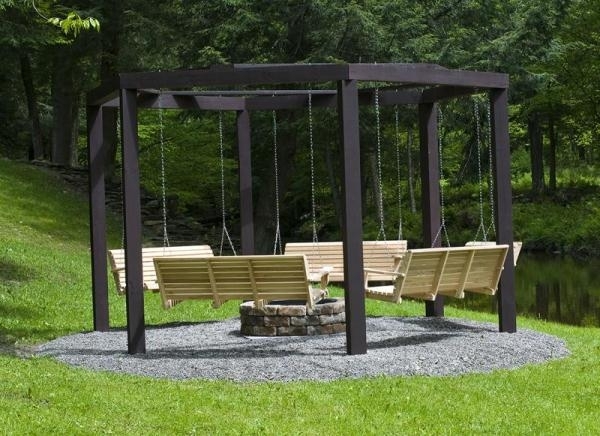 The swing and frame are made of cedar along with the table insert for the fire pit. For the paver patio we chose to use two different pavers. The Willow Creek Circlestone in Lakeshore Blend for the area around the fire pit and Willow Creek Slatestone Bleu was used for the landing. We also used an accent paver around the border to create visual contrast. The fire pit itself has a built in receiver for a wood fire cooking grate to be placed over the coals. The fire pit table insert is designed to “snap” into place so it will not fall into the pit or be unstable. It can be a great picnic and lounge area during the day, but when the sun goes down the fire pit is ready to be the center piece of this patio. And if you are so inclined, you can grill dinner right on the open fire! Please click HERE to contact us with any questions you have about this project or any of our Services! I have always enjoyed getting asked what needs to be done to maintain paver patios because the easy answer is NOTHING. I don’t change my mind very often but a change of mind was in order when it comes to the value of paver maintenance in the form of sealers. There are a lot of great reasons to consider pavers for your patio, walkway or driveway. One big reason people choose pavers is because of the aesthetic appeal over concrete. They look amazing and the things we can do with paver patterns and colors are unmatched in any other surface. In my line of work, I have to pay for a lot of insurance which is probably one reason why I hate insurance. But some things need to be protected. Your paver surface is an investment and should be protected. Luckily the insurance is cheap and the protection is good. The best way to protect and enhance your hardscape project is to have it professionally sealed. Sealers come in 3 different finishes: Matte, gloss and wet look. -Matte finish protects against all mother nature can throw at your patio. It also helps to strengthen the polymeric joint sand between pavers that provides interlock and prevents weeds and ants from ruining your patio. If you do not like the wet look but want protection, this is the right choice for you. -Gloss finish is exactly what the name implies, it provides all the same protection against the elements but with a couple of differences. The Gloss sealer comes with an antimicrobial agent that prevents mold and mildew from forming on pavers in shady areas that do not dry well. In addition, this sealer can protect with one coat, but if a high gloss is desired, two coats will really make it shine. -OK, you have put 3 coats of gloss on and it still just does not have enough bling for you. -Wet look sealers make your pavers look like glass. It comes with the same protection and antimicrobial agent as the gloss but more shine. It is the most aggressive aesthetic difference you can make with a sealer. It also typically lasts a little bit longer than the matte or gloss which leads me to my next point. Yes, you will have to have it re sealed. The matte and Gloss finish (depending on how many coats are applied) typically last about 3 years. If you use the same exact kind of sealer, the old sealer does not have to be stripped off. If you want to switch to a wet look from the Gloss, the old stuff has to be stripped off first. I know you are wondering what all these strippers and sealers will do to your prized rose bushes. It varies, companies like SEK do manufacture environmentally friendly products but they are still chemicals so steps do have to be taken to protect vegetation. In many cases we pre-saturate the soil around the plants or grass with tons of clean water so the roots don’t take in any of the chemicals and/or cover them with plastic. So consider your options, at the very least a matte finish sealer will provide years of protection to keep your paver surface looking new. Ask us anything and if I don’t know the answer, I will find out. We were here for 4 weeks after excavation and ended up hauling 3 full semi loads of retaining wall block in. Each block weighs 82 lbs, I still get a little twinge in my back thinking about this one. I also think this project turned into one of my favorite. By the time we finished, even the clients 80 year old mother could make it up to the top safely and there was a large courtyard at the bottom. I also had some fun with the design for the landings between teirs. I met this client when he called me out to install a small paver patio in his front yard. He mentioned that he had several other companies out to look at a larger project in the back yard but none had got back to him with plans or a quote. When I turned the corner, I knew why immediately. This kind of project is right in our wheel house and we got to work on the design right away. He asked me for a backyard and since there was none, we had to create one. We started by digging and hauling truckloads of overburden out. The next step was the retaining wall and grading work. We had to bring in a structural engineer to assist with the design as we needed to know how much load the back wall could support. This was important in deciding where we could set grade and therefore affected the project as a whole. If we would have filled up too high on the back wall, we could have caused structural damage to the home. 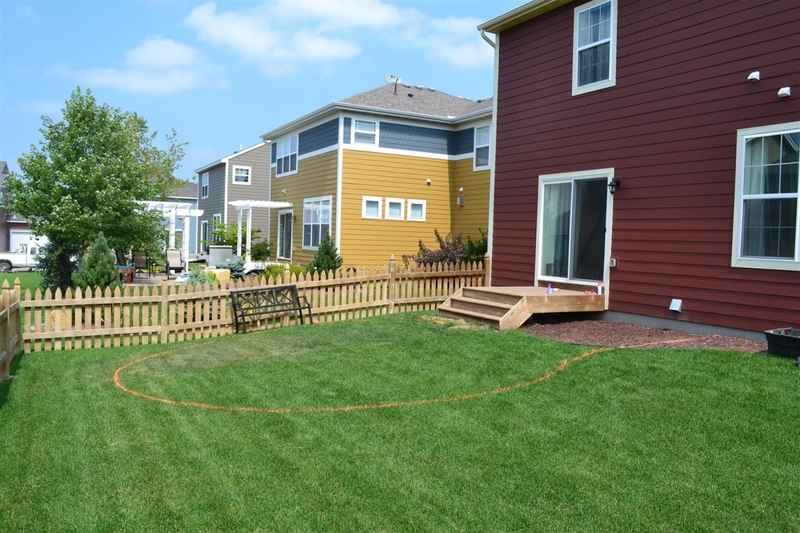 This project turned out fantastic and we were able to deliver on our promise to create a back yard!